The public is invited to the NEOMED Education and Wellness (NEW) Center Grand Ballroom Tuesday, Sept. 25, at 3:30 p.m. for the inaugural Drs. Fred and Penny Frese Lecture. The event features Elyn R. Saks, J.D., Ph.D., a winner of the MacArthur Foundation Fellowship (better known as the genius award). 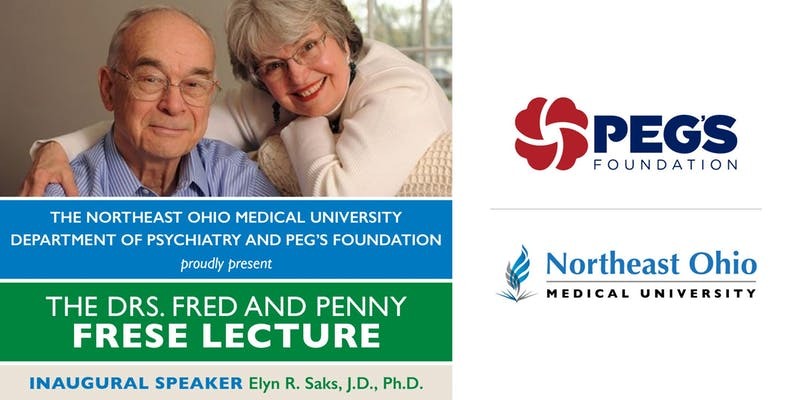 Presented by NEOMED and Peg’s Foundation, the new lecture series honors the legacy of the late Fred Frese, Ph.D, and Penny Frese, Ed.D., by sharing stories of individuals living successfully with schizophrenia and other serious mental illnesses – and the ways in which their loved ones support their recovery. Dr. Saks is the Orrin B. Evans professor of law, psychology and psychiatry and the behavioral sciences at the University of Southern California Gould Law School. She is a mental health law expert who wrote a best-selling book titled The Center Cannot Hold about her own experience living with schizophrenia. The lecture is free and open to the public, with registration requested. Visit the event registration page.